After Serra Angel faded from competitive constructed play (which, to be fair, also had something to do with her being excluded from the Fifth and Sixth Edition core sets), Morphling stepped into her previous role. In certain ways, he’s even stronger, due to his inbuilt ability to protect himself from both damage and targeted removal spells. 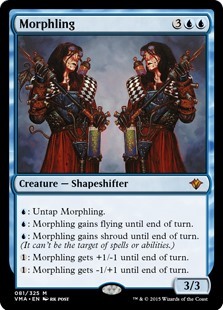 Being blue also meant that control decks could change their configuration if they so chose – mono-blue decks didn’t have to pick a weaker finish any more, and they could go to black or red without losing their five-mana dominator card. For some time, he was the most powerful creature in Standard and possibly in all of Magic, seeing play even in Vintage (Type I, back then) decks like Keeper. Legacy and Vintage are no longer in a place where he is as advantageous as he was in the early 2000s, but he can be very hard to address in casual settings. I wouldn’t be surprised to see him start to appear in the new Premodern format, either. One of blue’s iconic creatures of old, alongside Serendib Efreet, Morphling represents a hard-to-kill finisher that has been iterated on many times since. As long as you have one extra manner when you put Morphling out there, it becomes almost impossible to kill, really only ever dying to a full board wipe; its pump abilities let it move out of range for burn or -X/-X effects (or go in for one big swing), shroud on demand means targeted kill spells won’t work, and flying and pseudo-vigilance let it hit and live to fight another day. It’s been iterated on in the years since in three of the other four colors, and while it itself can’t ever see a reprint (Reserved List, woo), its legacy has been felt in the years since then. It’s too expensive for Legacy and not broken enough to cheat in over other targets, but Morphling is still a wildly-influential creature with a long lineage stemming from it.